Referenced on p28, Knight - Noble Warrior of England 1200-1600 by Christopher Gravett. Two statues from the west front of Wells Cathedral, c.1230. The helm of the left-hand figure has a single vision-slit. Note too the stiff upstanding shoulders of the surcoat and the lack of a waist belt. The other figure wears a padded arming coif with a roll around the brim to support a helm, and a stiff throat-defence, all worn over the mail coif. The surcoat has a dagged lower edge. 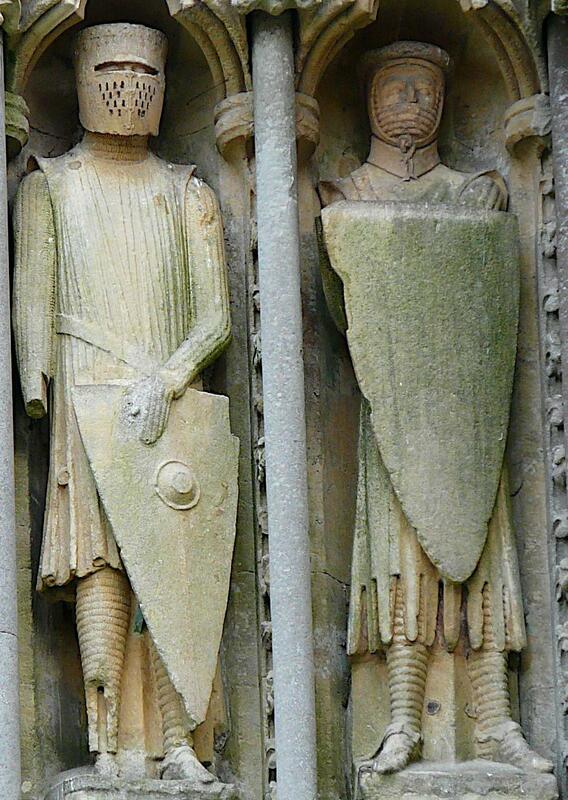 Most of the armoured figures on the facade of Wells Cathedral wear standard mail hauberks and chausses. One, or perhaps two, figures (B and C) have the angled shoulders that suggest padded gambesons beneath the surcoats. 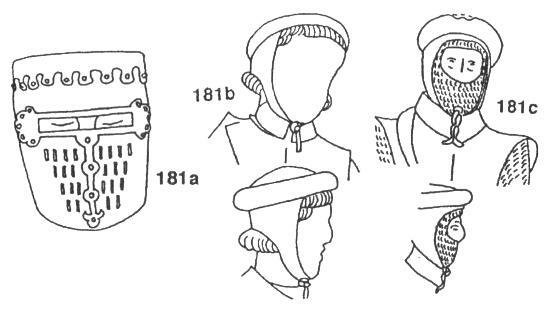 The possibility that some padding or even stiffening formed an integral part of the surcoat is reinforced by the raised and clearly stiffened collars that protect the throats of two figures (B and C). One figure (C) has a mail hauberk and coif beneath these padded elements, while another does not (B). Both, however, wear cloth coifs with large padded squabs around the head which are obviously intended to support great helms. One such great helm is present in the Wells carvings (A). It is of an early form with a single broad eye-slit reinforced at the edges by an additional piece of metal which also runs down the front of the helmet. The top plate is turned over the edge and riveted. See also Wells Cathedral statues 125 & 126 of knights in arming caps, Wells Cathedral statue 145 of a knight with a heaume & Wells Cathedral statue 147 of a knight without a heaume.